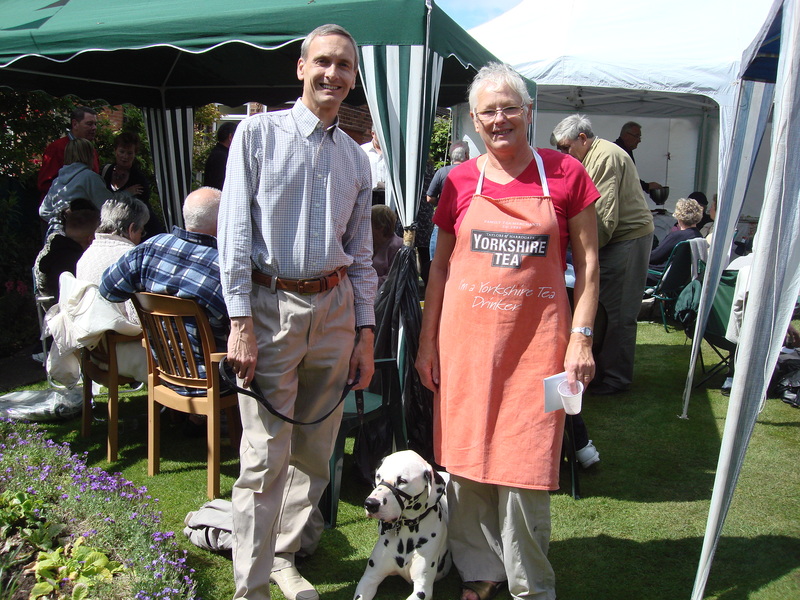 Yesterday Sue and I ( and CeeCee ) attended a BBQ organised in order to raise funds for various charities. Fortunately despite threatening clouds the weather stayed fine. This entry was posted in Local News by David Nuttall. Bookmark the permalink. Yes, Mr Bailey, but was I said was ABSOLUTELY no case. Yes the financial meltdown was caused in part by the banks, which is no doubt what you are getting it. It was also caused in very great part by the Labour Government as well as individuals spending too much themselves and getting into debt. Did you take out a mortgage you could never afford to pay back like many did? And even if it had been all caused by one director of one bank, it has happened and we are where we are. “Miss, he started it” wouldn’t help much when the school has been burned down. Everybody else is being hit by this crisis. People losing jobs, everyone having to work until they are older, many people not getting pay rises. Yes I realise that teachers may not officially get pay rises this year, but they will. Even if they get a NIL inflation increase, many will still get an increase in their grading, regardless of how good, or bad, they are!! If you listen to the teachers’ unions you would think that only their job got more difficult when they get older. All those with private pensions had them raided by Gordon Brown when there wasn’t even a financial crisis. No case? Really? Sorry but I must have been in a coma when the teachers and the lecturers caused the financial meltdown. The Coalition haven’t even carried out a review of the pension schemes. It’s absolutely ridiculous that our teachers who are giving the skills and knowledge to tomorrow’s leaders and to those who will rebuild the economy should have to pay a high price. Good on the teachers – get your message heard loudly and tell the government you won’t have your arm twisted that easily. Following Alan’s comments rather than the heading on this page, I am fully in agreement with the plans on Public Sector pensions. As far as I am concerned the unions have ABSOLUTELY no case. But they appear to have a considerable amount of support even outside their own members. Frankly the Governments PR is appalling and unless it gets it sorted out no controversial policies will ever make it to the Statute Book and the country will remain in the mess that it is. Get this sorted. If you can’t do anything nationally, then at least lead a campaign in Bury. What has happened to my comment on this post. Why don’t you report on more serious matters like you voting to allow employers to pay less than the minimum wage on a bill which was not supported by the government . This was a backdoor attempt to bring down the minimum wage and was seen as such by the minister who called the bill flawed and which was soundly beaten by 33-5. I notice your comments on everything other than your local meetings with charities, which are fine, are getting few and far between and one wonders why. Your record on voting against everything to do with workers rights and your constant fillybustering is disgracefull and i feel you should explain yourself to the people of Bury as to your reasons for voting on things you do NOT have a mandate for and were not in any of your pre-election leaflets. You seem to want people to see their incomes slashed by various benefit cuts and increased vat but you are happy to accept a £5,000 increase in your office costs. I do agree with some of the government policies because i am not blinkered like most tory voters, things like getting people who can work into work and making public sector workers pay more for their pensions instead of asking ME to pay for them, nobody paid for a pension for me and most companies in my industry do not have pension schemes and private pensions are a con. As i write i learn of YET ANOTHER u turn, oh dear, poor old Maggie will be spinning on the spot, how many are we upto now, about 15 i think all under the guise of ‘listening to the people’ why don’t they listen first. roll on the election which i am sure we be sooner than people expect. I voted in favour of the Employment Opportunities Bill which amongst other things would have given people the right IF they wished to be able to agree with an employer to work for less than the National Minimum Wage a right they could withdraw at any time. Hi David, i have seen some poor responses to letters on here but your reply to mine takes the biscuit. You know as well as i do that a lot of employers would take advantage of this stupid bill had it gone through. You make no comment on the fact of the government saying they wanted to reduce the cost of parliament and in the same breath MPs accept a £5,000 increase in their office cost, it beggers belief. No comment on voting for non mandated policies, loss of income and vat increases, which you voted for, and the CONSTANT u-turns of your lot. I have a question for you but i do not expect a Proper answer, why do you always talk bills out that refer to employment wrights such as technical points on strke laws, since when have you had a strike in a solicitors office.I notice you also evaded the point i made on public service pensions, including MPs over generous pensions, again why should i pay for yours, you paid nowt for mine. I really do think you should have the curtesy to answer more fully to people who take the time to write and hopefully expect a decent reply, but it seems you do not listen to the voters, just like cameron, and you seem to think voters do not deserve a proper reply. I would like to give you a freindly warning to improve your performance in the house or you will find yourself seeking fresh employment after the next election because there are more people who watch the goings on in the house than you realise. Alan. Whilst I endeavour to send replyto all personalised letters and emails whilst I allow all comments ( subject to excluding spam and potentially libellous comments) I do not undertake to spend time replying to them all. if anyone wishes to have a specific query answered they can always email me. Everyone seems happy with this system and I have had no complaints about it ( other no doubt from you! ). Anyway on this occasion I will reply more fully to your comment. To be quite honest I do not understand your point about office expenses. We are not paid an allowance we are only entitled to claim reimbursement for money we have spent on our offices. The whole process is subject to very strict rules and run by the Independent Parliamentary Standards Authority. I do not accept I am involved in ‘constant fillybustering’ as you suggest. I have only made a few speeches of more than an hour and under the Standing Orders it is always open for the House to vote to bring a debate to a close if it so wishes so as to prevent a Bill from being talked out. As for your claim of constant U-turns I think you must be referring in most cases to the ideas which have been the subject of consultation and when the Government announce a policy the media call it a u-turn. In any event if the Government never listened it would be accused of being intransigent. In answer to query about trade union laws I am pleased to say that when I ran my Solicitors firm their was never even the talk of a strike because my staff understood that their jobs relied on us providing a good quality service for our clients and that if they went on strike the only people who would lose out would be themselves. With regard to your query about pulic service pensions I fully support the Government’s proposals to reform public sector pensions and this will include the pensions that are paid to MP’s. I fully agree with you that the current system of public sector pensions is unsustainable and I hope the Trade Unions will be able to agree some sensible reform of the system with the Government. Thanks once again Alan for taking the time to comment.